Arratia Beer is pleased to present The Minotaur Trilogy, the first solo exhibition by Mary Reid Kelley with the gallery. Working primarily in video, Mary Reid Kelley’s meticulously composed scripts contest conventions of written language and spoken word, fluctuating between comic and tragic interpretation. Often parodically borrowing the satyrical and nonsensical verse structures of Alexander Pope and Lewis Carroll, the videos’ fractured poetical narratives reflect their characters’ deluded, perilous states. In this most recent trilogy of films, the artist plays every character, transformed through her distinctive monochromatic palette, wigs and heavy make-up. Made in collaboration with Patrick Kelley, her videos are elaborate constructions which include live-action performance; props and set design; drawing, graphic animation and printed word. Comprised of three films --Priapus Agonistes (2013), Swinburne’s Pasiphae (2014) and The Thong of Dionysus (2105) – The Minotaur Trilogy explores the mythological monster’s tragic family tree. The trilogy fuses ancient drama, modernist literature and contemporary pop culture, satirizing the promise of progress through razor-sharp observations on gender, desire, and vanity. Priapus Agonistes combines elements of Greek mythology with details of the church volleyball tournaments that the artist witnessed as a child. The Minotaur, re-imagined as female, dwells in the labyrinth of a gymnasium basement. Her sacrifices are culled from the members of the losing volleyball team. Like Jorge Luis Borges’ portrait of the Minotaur as a vulnerable anti-hero in The House of Asterion, the Minotaur of Priapus Agonistes hopelessly wanders an environment of repetitive space, using her victims as landmarks to help her navigate a path to the lavatory. In the second film, Swinburne’s Pasiphae, Reid Kelley adapts the Victorian poet Algernon Charles Swinburne’s bawdy dramatic fragment Pasiphae, which tells the unlikely story of the Minotaur’s conception. Unpublished during Swinburne’s lifetime due to its shocking sexual theme, the poem stages an interaction between master artisan Daedalus and the Minotaur’s mother, the bewitched Minoan Queen Pasiphae, who is cursed with an insatiable wish to mate with a beautiful bull. Symbolizing, respectively, reckless creative power and the torment of unfulfilled desire, Daedalus and Pasiphae indelibly dramatize the complex collaboration of artist and audience. In The Thong of Dionysus --the final installment of her Minotaur trilogy—the artist further revises the mythologies of the Minotaur, Dionysus, and Ariadne. By participating in this cyclical refreshment of myth, and in concluding this trilogy devoted to a strange and ancient family, Reid Kelley performs a ritual repetition echoed in the multiple meanings of her distinctive pun-filled narratives. The Thong of Dionysus finds the god of wine and three Maenads polemicizing on the advantages and nature of drunkenness, while propositioning Ariadne to join them on the island of Naxos. In the Labyrinth, the hero Priapus hunts the Minotaur, mistakenly falling in love with the monster’s corpse: “I like a sense of humor in my honey / I love a joke, and you smell funny.” His declaration of devotion in the Labyrinth, and Ariadne’s attempt to find, in the Maenads’ phrase, “a raisin to live”, unfold a linguistically seasick tragicomedy of love, abandonment, and death. The video installation is accompanied by 8 photographic portraits of poets, rappers, thinkers and artists whose work contributed to the artist’s concept of a “Dionysian” writing, manifesting in the films as a dark, shape-shifting wordplay that collages the tragic and ludic. 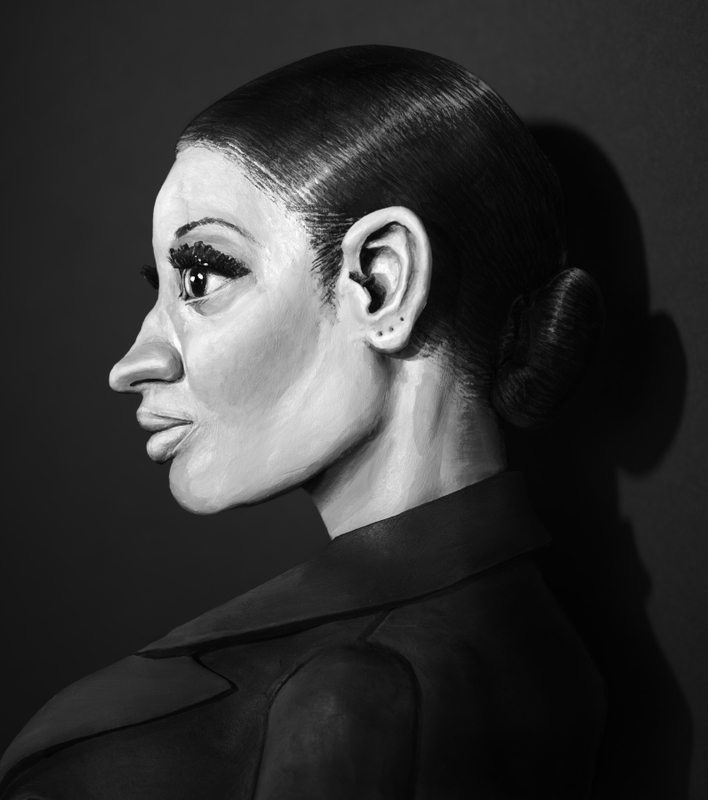 These portraits, part homage and part caricature, range in time and subject from Euripides to Lil’ Kim. While they share an emphasis on parody, masking, and costume with The Minotaur Trilogy, the portraits, photographs of meticulously modeled and painted heads, reveal a cast of specific personalities that contrast with the film’s symbolic, mythological personae.